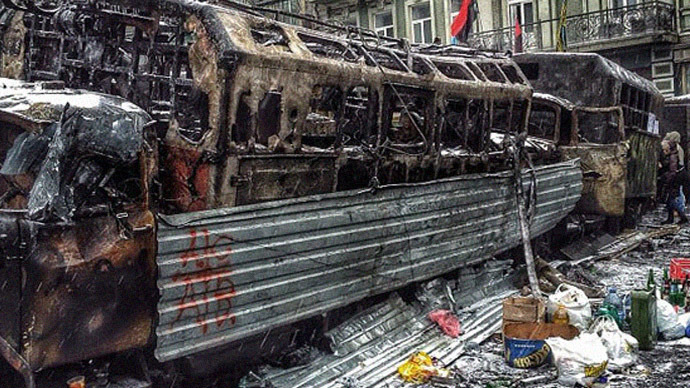 “The US is behind everything that is happening in Kiev’s downtown right now. The financing is coming from over there. This has to be stopped. That is what we came out here to say to the whole world: ‘US - stop! 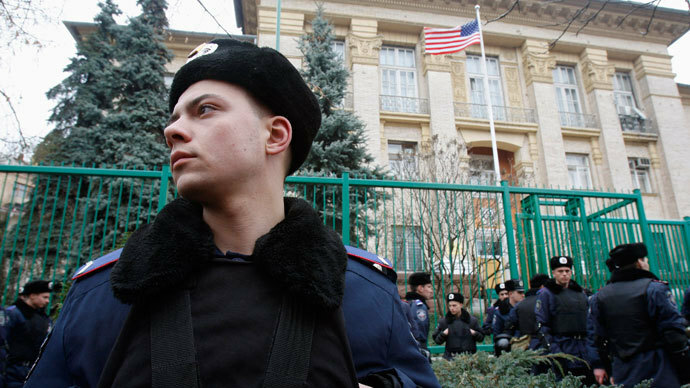 US - there needs to be peace in Ukraine,’” said Ivan Protsenko, one of the movement’s leaders. 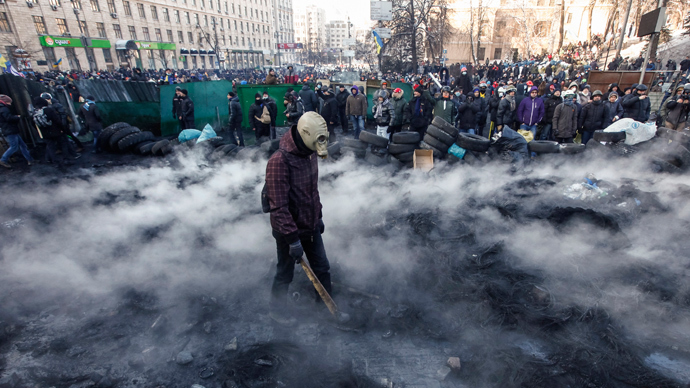 Rioters on Grushevskogo Street continue to burn tires, with building No. 4 catching fire from the high flames, Unian news agency quoted the Ministry of Internal Affairs as saying. Police have been holding their line throughout the evening, attempting to extinguish fires with water cannons. 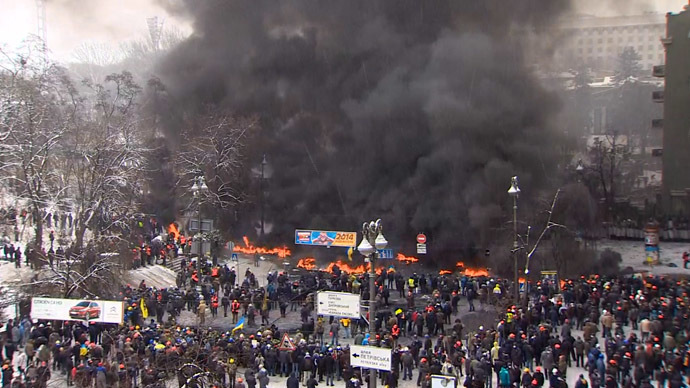 After four days of protests, the center of the Ukrainian capital continues to resemble a warzone, with smoke, barricades, and debris all around. Wednesday's clashes between rioters and police intensified in the afternoon after riot police cleared Grushevskogo Street. Footage from the Ukrainian capital showed hundreds of police officers using tear gas, rubber bullets, and stun grenades against the protesters. The dispersal is the largest to take place since the latest outbreak of violence began four days ago. Some clashes involved policemen snatching individual rioters from the crowd and brutally beating them. Rioters threw firecrackers, Molotov cocktails, and stones at police. Despite some episodes of police brutality, security forces largely refrained from attacking rioters. Former Ukrainian president Leonid Kravchuk said he is grateful for the patience that police officers and the Berkut unit have shown while confronting rioters on Grushevskogo Street. The riots have reportedly left two people dead and at least 300 injured, according to local media. 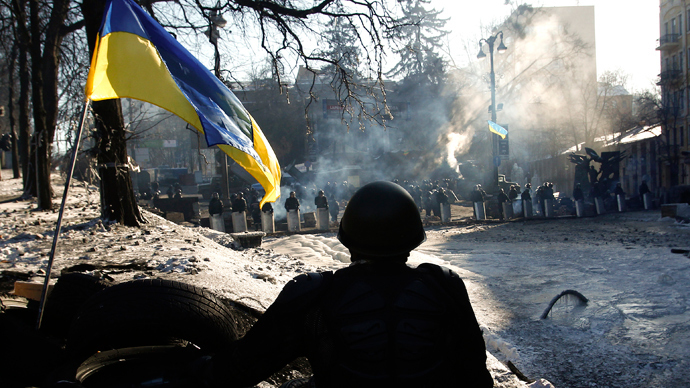 Ukraine’s Ministry of Internal Affairs said on Wednesday that more than 70 people have been detained during the unrest. Ukraine's prime minister, Nikolay Azarov, said police were not given any additional instructions on the use of force against the protesters. Conversely, procedures now in place ensure minimal use of force against even the most violent rioters. "Instructions given to law enforcement authorities were simple: avoid the use of force against peaceful demonstrators, and prevent violent seizure of government buildings and institutions,” Azarov said in a BBC interview. The clashes erupted after a massive rally was held in Independence Square on Sunday, where protesters spoke out against new laws adopted by the Ukrainian government last week.